it is now in the GBG - only two ales on Taylor's (yuk) Landlord and a stout. The stout was a nice pint. It has a wine bar feel to it now though and the old style character pub it once was has now gone. Think I'd prefer keg beer and a proper pub to be honest. I'd not been to any pubs in Kilburn before. So, the Sir Colin Campbell was a first. There are rooms either side of a central bar. It is nicely decorated with plenty of wood. There are 3 handpulls in each bar. But, the solitary real ale was Siren Under Current. Apparently, Timothy Taylor Landlord & Wild Beer Millionaire had just gone off. Not a bad place. Just a shame, there was only one ale on and that it wasn't really my type of beer. A bit of a Doctor Who kind of experience - as in stepping from Mogadishu High Street into a bar in 1971 Ballyturbet. No proper ale, so I plumped for the lager (should have gone for Guinness really but only realised that afterwards). 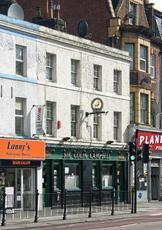 Nice friendly lady behind the bar and a very clean pub throughout. The one or two locals did seem to echo that 'I wouldn't talk to your pigs so why should I talk to you' unwelcoming kind of mentality but I quite liked the place based on this visit. There are lots of advertisements adorning the walls of this U-shaped Irish pub advertising traditional music on Friday and Saturday nights, but it was very depressing during my Saturday afternoon visit. There are a couple of TVs at the badly lit rear, but no Sky Sports and surprisingly the Guinness wasn�t up to scratch. The barman was a nice chap, but I go the feeling that the old boys in attendance would have preferred it if I had walked past the pub. There is a dartboard, but there was seating on the oche and I�m not sure that I�d want to stay for a game anyway. I�m a big fan of Irish pubs, but not this one. As for Trad. Irish Music and Irish songs it was a great Pub to be in for St. Patrick�s Night / Weekend and during Easter , with its usual Saturday Irish Music session . Conversation referring to the Auld Country and of times past were heard frequently through the evening and night . The Quiz Master who holds the regular Thursday night Quiz contributed his penny�s worth as usual . Very enjoyable .